When it comes to carpet cleaning, many of us automatically think of a vacuum cleaner or some other kind of deep cleaning appliance that has the ability to draw dirt and dust from being embedded in the pile. However, there are some messes that don’t clean up as simply with the flick of a switch or the push and pull of an electric motor and dust bag. Because living can be messy, we’re going to take a look at how to clean up one of life’s most frustrating carpet messes that anyone has to deal with: removing candle wax from carpet. Because, if we don’t have to, we don’t really want to call a professional to do it for us. Candle wax stains can be extremely difficult to deal with, especially from carpets. You will need: Ice pack or ice in a plastic bag, dull butter knife, carpet spray or cleaning solvent, rubbing alcohol if the wax mess is colored, vacuum cleaner with upholstery tool or brush, a dry clean white cloth or terry cloth and a clean damp rag. To remove wax using a cold method, you must first find a way to apply cold directly to the trouble spot. You can take a plastic or zip-locking bag and fill it with ice, then let that bag sit on your wax stain long enough. You will need more than just one simple ice cube to get the job done. Wait until the wax is solid, hard and brittle, which should only take a few short minutes. If you have ice packs, that can work as well. You must have hard wax to then scrape it out. Once the wax is perfectly hardened, use your dull butter knife to shave, chip and flake away at the stain. The objective here is to get rid of as much of the bulk of wax as you can, so that when you are ready to apply a cleaner, there is minimal wax left to dissolve. Keep in mind that you shouldn’t use anything sharp at all to work on your carpet stain, as this can damage the carpet and pull it up. If you don’t have a dull butter knife, a thin object like a credit card will suffice. After you work at the wax for a while, you should have fine, loose shavings of wax littered around your stain spot. Remove this with your vacuum cleaner attached to the upholstery tool. 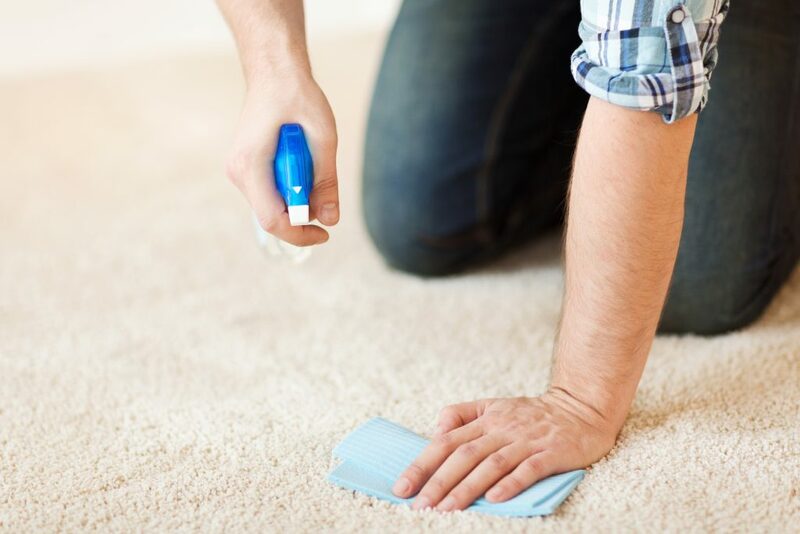 You can give it a quick vacuum clean up here, but keep your upholstery tool handy if your carpet is particularly high pile, as you will need it for a consequent step. Apply carpet cleaner or solvent to the wax stain to dissolve the remaining wax. If you did a good job with your dull butter knife tool, you should have very little wax left to get rid of out of your carpet. If your wax stain was caused by a colored candle, you may have a colored stain in your carpet, especially if your carpet is a light color and the candle wax contained a vibrant hue like red or purple. Use rubbing alcohol on the dry cloth to remove any remaining dye color stains from the wax. When the wax is gone, use a clean, damp rag to blot the treated spot to remove any chemical residue. Repeat until the carpet is completely clean. Let your carpet dry for twenty to thirty minutes. If you have high pile or plush carpet, you will want to use your vacuum and upholstery tool return the carpet to its buoyant and fluffy texture after all of that freezing, scraping and blotting. Another way to clean a candle wax stain or stains from carpet, this way to remove wax involves lifting melted wax out of carpet. With this method, you can begin cleaning it right away, while the wax is still soft. You will need: Either the combination of brown paper bags and a clothing iron, or white paper towels and a blow dryer. Rubbing alcohol, carpet spray or cleaning solvent, a towel, a clean dry cloth and a clean damp rag. To remove wax using a heat method, your objective is to heat up the wax stain spot so that the wax melts and is absorbed out of the carpet. In order to do this, you must first place your paper towels, if you’re using the blow dryer method, or your paper bags for the iron method, onto the wax spot. If you are using a clothes iron and paper bags to remove the stain, make sure your iron is set and heated to a medium setting, as you don’t want it to be too hot. Make sure the steam setting is turned off. If you are using a blow dryer and paper towels, you can set the blow dryer to a high setting. When it has been warmed up, place the hot iron over the paper bag, directly over the stain and iron it slowly. You can check that the wax is melting in every 10 seconds or so, to prevent burning the paper or starting a fire. As the wax heats up and melts, it will begin to absorb into the paper bag. Take care not to burn yourself. As the paper bag begins to saturate, shift it over so that the saturated, used, moist part rests on a towel and an unsaturated part of the paper bag is over the stain, in order to continue absorb the wax out of the carpet. The towel over the wax is important from preventing the warm wax on the brown paper bag from soaking into another spot of the carpet while you continue to absorb the rest of the wax out of the carpet. If you are using paper towels and a blow dryer, blow the paper towels over the wax stain in order to heat and melt the wax. As the wax melts, it will absorb into the paper towels and as you see them become saturated, swap the wax-drenched sheets for fresh ones and continue the process until all the wax has been absorbed. Once all the wax has been lifted away, there may be a stain if the wax had color. If you find that there is dye remaining in your carpet, use a clean cloth and rubbing alcohol to rub the stain out. Then apply carpet cleaner or solvent, just in case there is some wax residue left in your carpet. Use a clean, damp cloth to blot the spot and remove any chemical residue from the carpet. If your high pile or plush carpet seems to be out of shape from all of the hassle, you can use a vacuum cleaner with an upholstery tool to revive the fibers of your carpet and return it to its fluffy plushness. 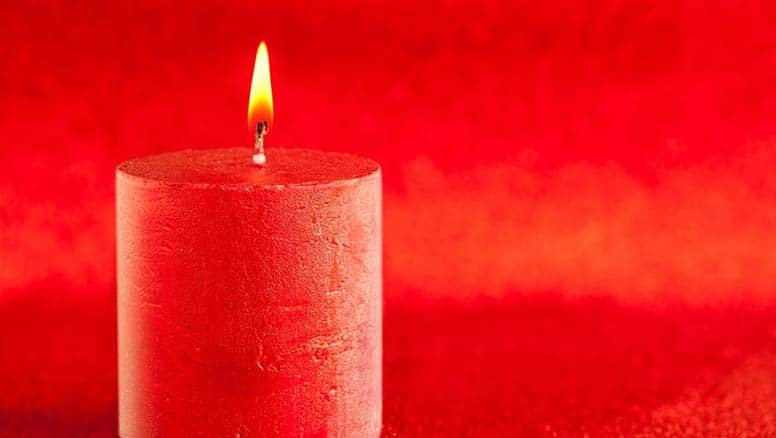 Especially during a holiday season filled with festive candles, spilled candle wax is something that us homeowner will have to deal with once. Thankfully, it is rather fast and easy to remove wax from a carpet floor once you know what to do. If you have large chucks of wax in your carpet, you might want to use a combination of both methods. Start with the cold method to scrape off as much of the excess wax as you can. Once you’ve scraped up as much wax as possible, switch to the hot iron over brown paper, or the blow dryer with a white paper towel (or a few white paper towels, realistically.) The best part about it is that most of us have a hair dryer or iron, and some brown paper bags or white paper towels at home, along with butter knifes and cold freezer items to use at our disposal. If you found this helpful, you can also use these methods to get candle wax stains out of your furniture.